"There's been a lot of time and energy and love put into what Thursday night will be." That's pretty much all Michele Ganeless will say about Jon Stewart's final edition of "The Daily Show." Ganeless, the president of Comedy Central, and the rest of the people involved in the show are staying tight-lipped about Thursday's finale. It's doubtful that dozens of celebrities will fill Stewart's studio, a la Stephen Colbert's farewell episode last December. But there will definitely be some surprises for viewers. The finale will air at its usual time, 11 p.m., but will be extra-long. Right now it's slated for 50 minutes. Stewart, more than any other person, has defined Comedy Central's identity for the past 16 years. In a telephone interview this week, Ganeless said it is a "bittersweet time" for the channel; she said she's been "having a hard time wrapping my head around this, like, 'No, we're not going to do this every day anymore with him.'" Her feelings have been echoed by numerous television critics and ordinary fans. But Stewart, she said, has had no second thoughts about leaving the anchor desk. "He's ready. He's ready," she said. "One of the nice things about this moment is that he's doing this on his terms, on his timeline, when he feels like he's done whatever it was he set out to do 17 years ago." 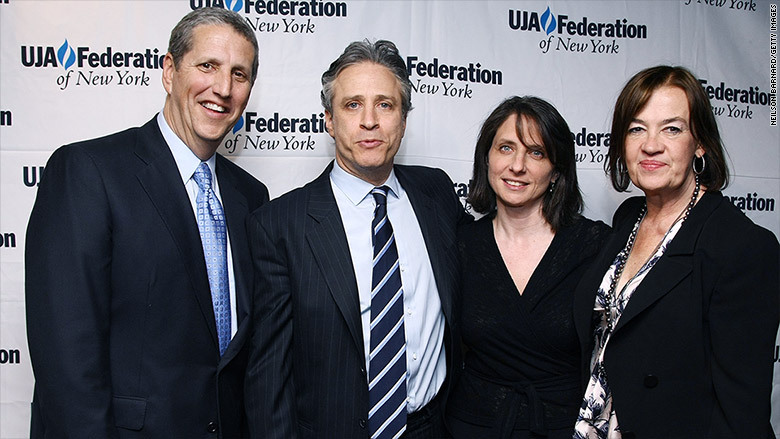 Comedy Central president Michele Ganeless, center, with Jon Stewart and Viacom executives. Ganeless said Stewart is retiring from the show for the same reasons he has alluded to: that he's tired (downright "exhausted," she said) of the daily production cycle and eager to try new things. Ganeless started working at Comedy Central in 1996 when "The Daily Show" launched with Craig Kilborn as the anchor. Stewart took over in 1999. She remembers very clearly Stewart's coverage of the presidential election in 2000 when network mistakes and a nail-biting recall provided weeks of comedy fodder. "The show really pivoted," she said, "and Jon became, in the viewers' eyes, somebody to look to, somebody to make sense of the craziness that was going on." 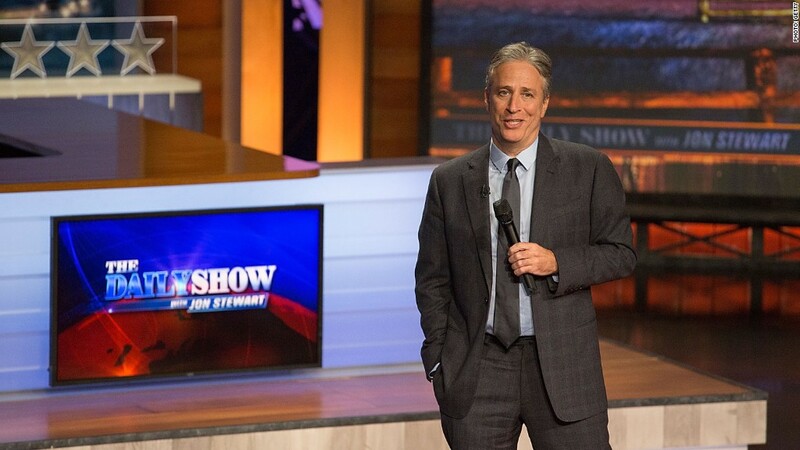 Asked to reflect on Stewart's legacy, Ganeless pointed out that the satirical anchorman has been careful to identify only as a comic, not as a serious figure. "He's the guy who always said, 'I'm just here to sell beer and make people laugh.' But we know -- and I think now even he'd admit -- that part of his legacy is that, through humor, he makes people see the absurdity in parts of the system and has been able to affect change." Ganeless will be in the audience for Stewart's farewell on Thursday. The taping will begin around 6 p.m.
"I'd be lying if I said there wasn't sadness and anxiety attached to this," she said, "but there's also a lot of joy in him being able to do this on his own terms." To that end, she didn't want to say much about Stewart's successor Trevor Noah. Comedy Central is saving that for September, closer to Noah's September 28 start date. Thursday will be all about Stewart.